How do you choose colors for your knitting projects? Choosing colors and color combinations that look good and that appeal to you is tricky. Developing your sense of color takes time and effort. But then learning to trust your color sense usually takes a smack over the head or two. For me, Anwar was a huge lesson in following my gut when it comes to choosing colors. 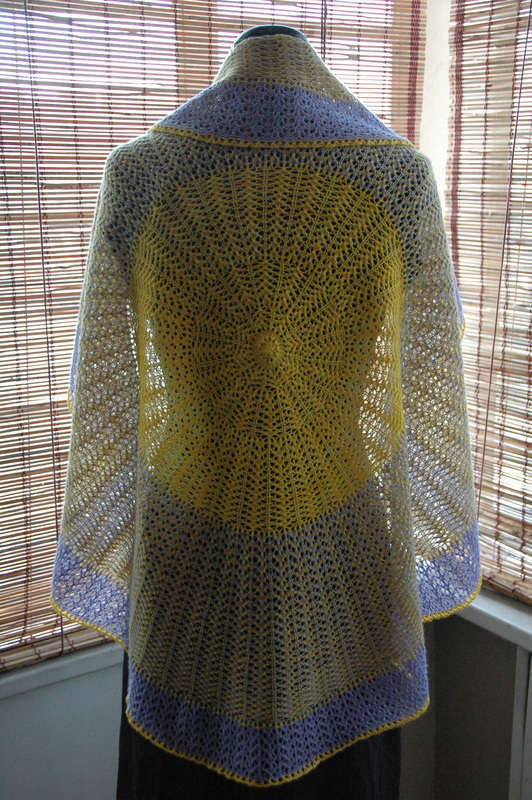 The initial idea for the shawl came about when Sharon contacted me about designing a shawl for a Spin & Knit-a-Long (SKAL) in the Spin a Shawl Ravelry group. 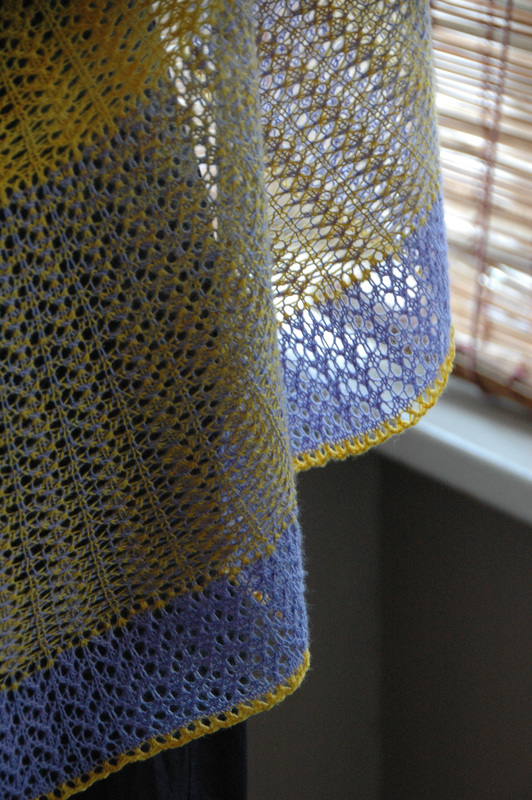 The idea was to create a circular shawl similar to Eirwen for a single ply lace weight yarn that the group members could spin yarn for and then knit together as a group. We came up with the idea of doing a color sequence that would allow the spinners to spin color A, then start knitting, as they continued to spin color B. So I did a block of color A, one by one stripes of colors A + B, then a block of color B. When I went down to my LYS looking for yarn I was looking for a single ply lace weight yarn that came in a good color combination. The fact that it needed to be a single made for a rather limited selection of yarns. There was Malabrigo lace, and Madelinetosh Prairie, and that was basically it, and neither of them had a huge color selection in stock. Which totally makes sense, not many people come in looking for lace weight singles. 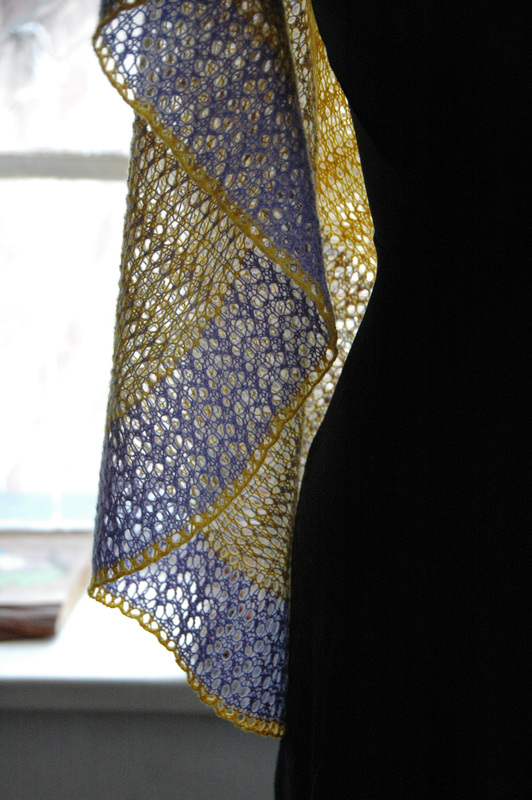 So I pulled out all the colors they had, and immediately grabbed the Malabrigo lace in Periwinkle and Sauterne. I thought they were intriguing but kind of weird together, so I set them aside and kept looking. I spent maybe an hour putting various combinations together, with help and impute and lots of cooks in the kitchen. There were some other nice combinations, but none that really popped, and none that were as intriguing as the Periwinkle and Sauterne. So I took two skeins of each color home, and put the skeins on my desk so I could look at them and think about it, and keep looking for different yarn. 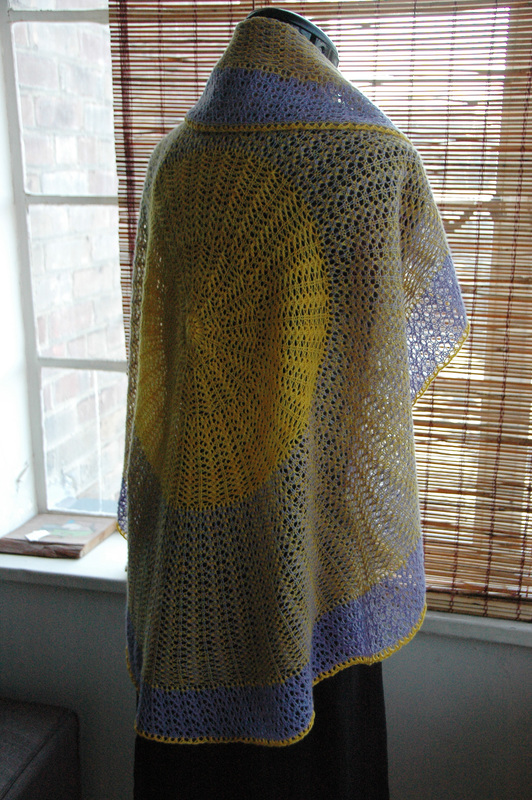 The reason I think it was so hard to find a combination that worked for this shawl was the color set up. Remember we decided a block of color A, one by one stripes of colors A + B, then a block of color B. This was so that the spinners could start knitting before they were fully done spinning. But this meant that the color combination had to be made up of colors that 1. could stand on their own as their own large blocks of color, 2. could work together for the stripes, and 3. not have one block of color overpower the other. 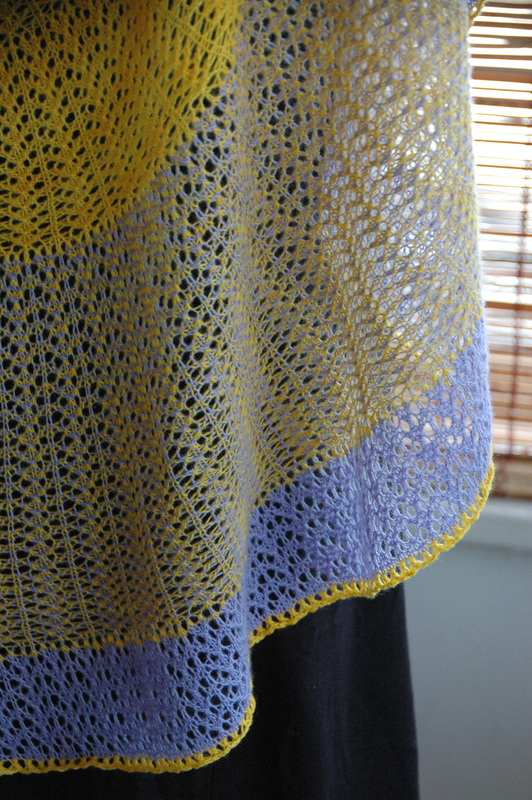 So I wound the yellow and started knitting. Still not sure, and still looking for something that could maybe take the place of the Periwinkle. I still didn’t find anything. Eventually I came to the point where I had to start the Periwinkle. So I started. And it worked. It worked really well. And I was kind of shocked. The whole “I’m not sure about this combination, but it seems like the best there is, and I can’t seem to let go of it” was a bit freaky, but turned into an re-affirmation in trusting my own color sense, over anyone else’s. And maybe more importantly trusting myself over my own ideas of what colors “should” or “shouldn’t” look good together. I still don’t know why this combination works, and part of me still says they shouldn’t work together, and they’re kind of weird colors, that on a bad day might look a bit like easter egg barf. But when I look at Anwar I know the combination works and they’re the right colors for the pattern, even though they are unexpected, and maybe even a little ugly, but in a totally fantastic way.